Weiqi or Go is very popular in Asia, where it is played by millions of people and there are even television stations dedicated to it! The 3 countries in Asia topped in Weiqi are China, Korea and Japan. Taiwan currently ranked 4 and is edging towards the top 3 ranking in the recent years as they have groomed many professional players. How old is Weiqi exactly? Since the game is so old, nobody is sure exactly how old it really is, mainly because literature recorded for its history were destroyed. Most historians think it’s at least 2,500 years old based on archaeology facts, but some say it could be up to 4,000 years old. Although books were destroyed but the knowledge of the game continued to live on. It seems that this game has no sign of aging or fading away. It gets more and more popular as days go by. This game doesn’t need publicity. Even after thousands of years, the game is still gaining popularity. The game is known by different names in different languages. For example in China, where Weiqi was invented, it is known as ‘Weiqi’, “Hand-talk” or “Sit-still”. Weiqi is also widely and popularly played in Japan and Korea. In Japan it is called ‘Igo’ means the surrounding boardgame. and in Korea it is named ‘Baduk’. The meaning of each different name is the same in each language. It means ‘surrounding board game’. Weiqi is well known for its depth of strategy despite its simple rules. Compared to many other games like chess, the object is to create rather than to destroy, to develop rather than to diminish. The concept of balance is essential in Weiqi strategy and a skillful Weiqi player must balance many different strategic needs. A good Weiqi player, usually we call them Dan players understands and emphasis on “thickness” in contrast with the opposite word “thinness”. As thickness of the friendly stones creates opportunity to attack your opponent, on the other hand, thinness of the stones invites opponent to attack yours. Example: Placing stones close together helps them support each other and avoid from capturing or attack. On the other hand, placing stones further apart leaves weaknesses. The key of the game is to find a balance between expanding and strengthening influences. A balance between attack and defense. One thing that differentiates Weiqi from other board games is the amount of freedom and creativity it allows. Despite recent advances in computer technology, computer programs are still a long way off being able to compete with the top human players. Weiqi activates both the creative and logical parts of the brain and allows players to strengthen connections between the two. Weiqi is an excellent game for exercising different parts of the brain.It’s an ideal hobby for brain training. Weiqi is a game of logic, remarkable strategy and complex tactical analysis. Although the surrounding game is essentially an abstract strategy game, it has been said to represent war, politics, stock markets and many other aspects of life. 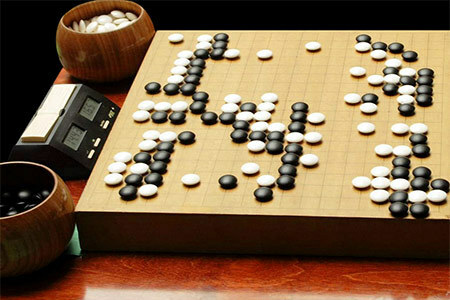 In Asia, it is commonly said that the game of Go reflects human life itself. Basically, there are two schools of play in Weiqi. One is competitive, high pressured game play and the other is casual, non-threatening and friendly. Competitive play is used for competitions as winning is the ultimate measurement of success to a player and therefore tight and forceful plays are often deployed. Competitive Weiqi is likened to a physical high pressure boxing match. Casual games are well-liked for players who value socializing above competition and people will rather play in this manner to make friends and enjoy the game in the world of Weiqi. Casual Weiqi creates warm atmosphere and encourage friendship making in the learning process.